Amy Adams seems to be everywhere right now, starring in just about everything you see from Charlie Wilson's War to Doubt. For good reason too, she is an oustanding young talent, who I look forward to seeing in further films in the future (as long as it's not Enchanted 2). Her latest film is brought to us by the producers of Little Miss Sunshine, co-stars Emily Blunt and Alan Arkin is called "Sunshine Cleaning." In the film Amay Adams plays Rose Lorkowski, who in order to keep up with the high costs of her son's private school, starts up an unusual business offering bio-hazard and crime-scene cleanup. Rose hires her unreliable sister Norah played by Blunt to assist her and hijinks ensue. 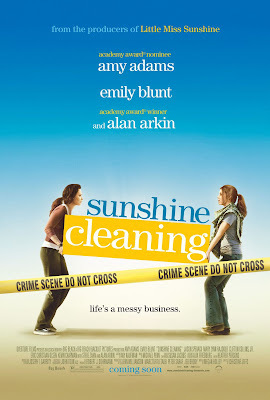 "Sunshine Cleaning" is directed by Christine Jeffs and is slated for a limited release March 13th. The film will also play Sundance this month. Below I have the first one sheet for what to looks to be a real joy. Scroll down for the full poster and trailer. Hellboy 3 & B.P.R.D. Spinoff? Fanning Vamped for New Moon? New Friday the 13th Poster! SNL + Apatow = Horror? Rockwell Confirms Iron Man 2!! Black Widow Will Be Blunt? Grace & Dead Snow Posters! Hudgens Howls in New Moon? Rourke & Rockwell: Iron Man 2?